Mactan International Airport don't forget your Terminal Fee! 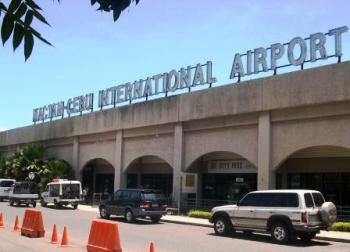 The Mactan International Airport, (MIA) is considered to be the busiest airport in the Visayas and Mindanao. After all, it doesn’t just cater to domestic flights, but also to international flights. It sends passengers to almost 15 cities all over Asia. It takes less than two (2) hours to fly from Ninoy Aquino International Airport in Manila, to MIA. If you are travelling from Cebu City, travel time will be around 30 minutes or less, depending on the traffic. Fortunately, the Marcelo Fernan Bridge, is in operation so you can pass with relative ease to the airport. It’s definitely less congested than the Opon–Mandaue Bridge. However, don’t cut your time to fine, you just never know what the traffic is going to be like, be there at least an hour before your check-in time. In truth, there aren’t a lot of things that you can do in Mactan International Airport. It’s a pretty small. There are less than 15 gates available. Usually, guests of passengers have to stay outside and wait, there just is not the room for passengers and guests for both departures and arrivals. There isn’t a lot of food booths or souvenir shops within the area. If there’s one thing that MIA is known for, it will be its people. Compared to other staff at other airports, security guards and airport personnel of Mactan International Airport are very accommodating and truly helpful, I know hard to believe but true. You just have to watch out for fake ones though, especially when you’re already outside the airport. They may not be in uniform or not wearing any ID, so always ask before handing anything over. These bogus guards have been known to take off with your bag or luggage. There are also interesting places to visit near the airport. First, you have the Pasalubong Center, the biggest souvenir store in Lapu-Lapu City. It offers wide variety of Filipino-made products, such as food, T-shirts, key chains, sandals, bags and guitars, which Lapu-Lapu people are well known for. You can also dine among the various kinds of specialty restaurants in Mactan Marina Mall. There is the La Tegola and Da Vinci’s Pizza, if you like Italian; Krua Thai, for Thai and spicy cuisines; and Tong’s, for pure Filipino food. There are also Korean and Japanese restaurants. MIA is also located opposite Mactan Waterfront Hotel, where you can not only dine but also play in their casino hall. 1. Avoid the taxicab as much as possible. Taxi drivers tend to overprice their fare when they know you will be going to the airport or arriving in Cebu City. It’s better if you can coordinate with a family member or a relative to pick you up or for the hotel to drive you to and from MIA. Food choices are very limited and somewhat expensive in MIA. If you’re on a budget, it’s ideal to bring your own snacks or food, which you can definitely take inside. Don’t forget to follow airport rules too. They don’t mind detaining you if you don’t. 3. Don’t forget the Terminal Fees. All departing passengers are required to pay a Passenger Service Charge or Terminal Fee. If you are departing Internationally then the Terminal Fee is P550/departing passenger. For Domestic departures the Terminal Fee is P200/departing passenger. It wouldn’t be the first time you were short the terminal Fee! Oh yeah if you don’t pay, like refuse to, then you will not be getting on your plane.